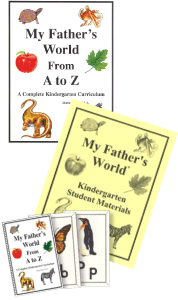 Little Red and I finished the My Father's World kindergarten curriculum today. When we finished her last item and she had closed her notebook, the tears started to flow down her cheeks. Looking at my beautiful daughter crying because she enjoyed school so much this year that she was sad to see it end, my mama heart just melted. I am so thankful that she loves learning and loved the means we used this year. Finding that perfect curriculum is a scavenger hunt. Sadly, it took me 6 years of searching to find one that both my children and I like. I refuse, however, to give in to the guilt that nags at me. You know those little questions like "Why didn't I find this curriculum sooner to use with the older ones?" and "Have I scarred my children for life because we used something different when they were in kindergarten?" I can wish that I had used My Father's World for the older three small people when they were in kindergarten, but that doesn't change anything. Instead, I will choose to look at this as a journey. Along the way we've had some speed bumps and potholes, but we've also seen some wonderful scenery. We've made incredible memories as we've explored using what the Lord led me to use each year. Jeannie Fulbright said something last weekend at the homeschool conference that continues to resonate in my ears, "Keep your focus on God's purposes, not on your purposes." He knows what my children and I have needed each year as we've navigated through school and life. I thank Him and praise Him for helping me with my curriculum decisions each year, for bringing me to My Father's World this past school year, and for teaching me to be content with the path we have taken. Oh, and by no means have I finished my school year in March. (Technically, I still have 9 days until I've hit my state-mandated 180 days for this year). We still have other things we want to do, read, and explore. And the bigger small people have a few weeks left in our Exploring Countries and Cultures to finish.